Choosing the right materials and design for your kitchen can sometimes seem overwhelming. There are many different benefits associated with both marble and granite countertops that it can seem impossible to choose. There are some guidelines you can follow to find the right materials, however, such as considering your lifestyle, your budget and your aesthetic. Whether you live alone, have pets or have children will have an impact on the type of countertops that you choose. For instance, if you have kids or pets, then you are likely to want a less expensive and more durable countertop to keep from breaking the budget or being easily stained. If you use your kitchen for looking many large meals, then durability can be a key factor; but if you only use your kitchen for one small meal a day, then cost may be a bigger consideration. Granite countertops can be less expensive to ship and install than marble, so they can be easier on your budget. However, you can sometimes find the right marble for your kitchen for cheaper if you live relatively close to a quarry. 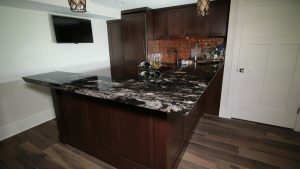 Things are some of the more nuanced things which go into budget considerations for countertops and your local supplier or contractor can help you determine which costs best fit your budget. Choosing countertops for your home is really an aesthetic choice, you are looking for something that looks great and functions well for you and your needs. However, you should also keep in mind resell value and some countertop materials will fit a broader range of aesthetics. For instance, stones such as marble and granite can appeal to a wide variety of homeowners, or perspective homeowners, so can both fit your aesthetic and increase your resell value. Granite countertops can be the perfect ones for your kitchen, whether you are building for yourself or renovating for resell. These countertops are durable and come in a variety of natural stone designs to fit almost any design.